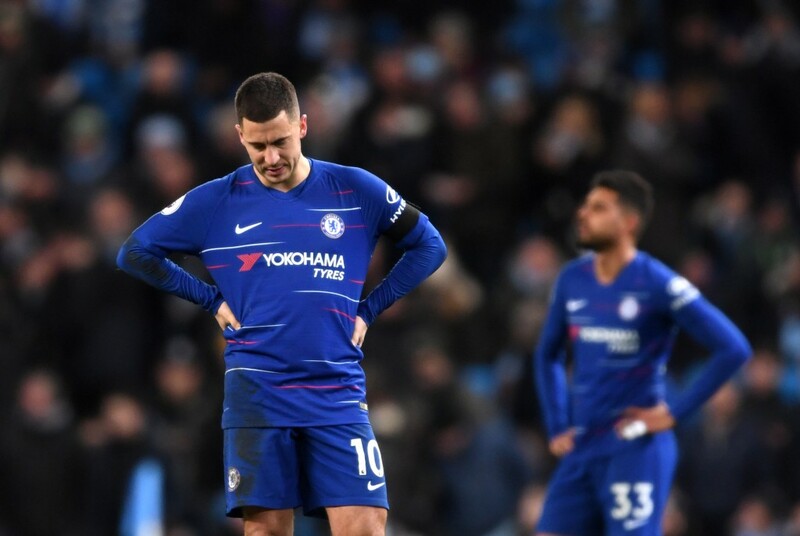 Chelsea were ripped apart 6-0 by reigning Premier League champions Manchester City on Sunday evening at the Etihad Stadium. 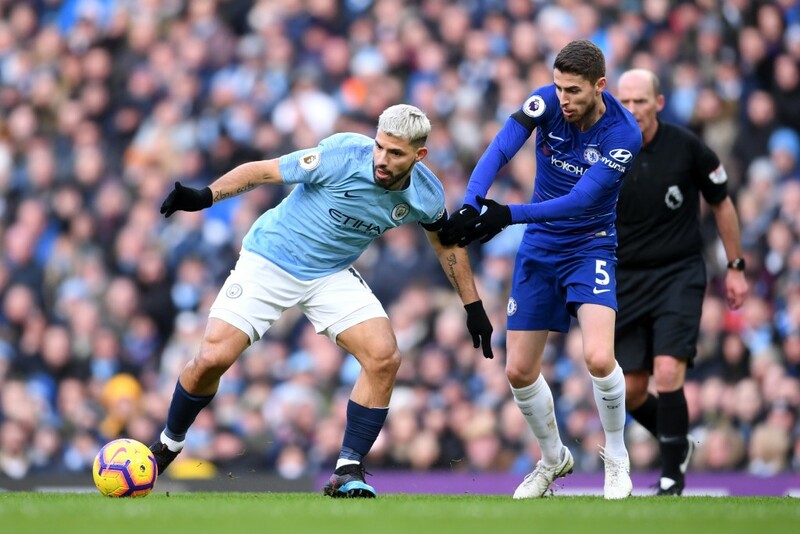 Chelsea were brutally thrashed 6-0 by Pep Guardiola’s Manchester City in matchweek 26 of the 2018-19 Premier League, with star striker Sergio Aguero leading the way with a hat-trick. It took just three minutes for City to find a way in behind the shoddy Chelsea defence, with Raheem Sterling thrashing home from close range. It would have been 2-0 minutes later if not for Aguero missing the simplest of the tap-ins, but the Argentine striker made amends scoring a screamer from 30 yards out in the 13th minute. The former Atletico Madrid man doubled his tally six minutes later, capitalising on a horrific error from Ross Barkley, before Ilkay Gundogan fired home the fourth with just 24 minutes on the clock. Pedro and Gonzalo Higuain threatened the City goal before half-time, but that was as good as it got for Maurizio Sarri’s side as Aguero struck from the penalty spot ten minutes after the break to heap further misery. Sterling then added his second in the 80th minute to condemn Chelsea to their worst ever defeat in the Premier League. The result meant Chelsea slipped down to sixth place in the Premier League standings, having started the weekend in the fourth spot. And here’s how the Blues’ stars performed on a woeful day at the Etihad. The world’s most expensive goalkeeper was hung out to dry by a hapless backline in front of him. Having said that, the 24-year-old should have done better against Gundogan’s strike, which he did get a hand to. Did make a couple of decent stops after the break, but letting in six goals will have done his confidence harm. Usually the most reliable defender on the park for the Blues, Azpilicueta was given a torrid time by the speed and movement of Sterling on his flank. 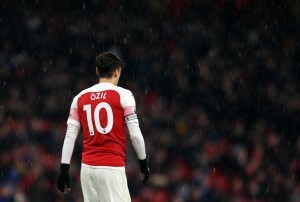 Uncharacteristically gave away a penalty in the second half, when he brought down the England international in the box. A day to forget. Reinstated into the backline in place of Andreas Christensen, the German international struggled to make his presence felt, although not for the lack of trying. Was guilty of allowing Aguero too much room to shoot for City’s second, while he was never able to come to terms with the movement of the City forwards, constantly getting dragged out of position. Part of a defence that failed to get anywhere close to the City attack. While he did not make any major individual blunders, the Brazilian was guilty of switching off and not doing the basics right, allowing too much space for the home team to dictate terms. The worst among Chelsea’s woeful defence. Abandoned his post and drifted in, allowing Bernardo Silva all the space in the world leading to the opening goal. Never recovered from thereon, as City enjoyed so much joy down his flank, while he offered next to nothing going forward as well. Subbed off in the second half and it will be a surprise to see him hold on to his spot in the next game. Not often does one say this about Kante, but on Sunday evening the Frenchman looked clueless. In his attempt to press high up the pitch, the World Cup winner left too much space behind him, which City made full use of. Tried hard to stop the City tide, but had little support and was overrun by the champions. 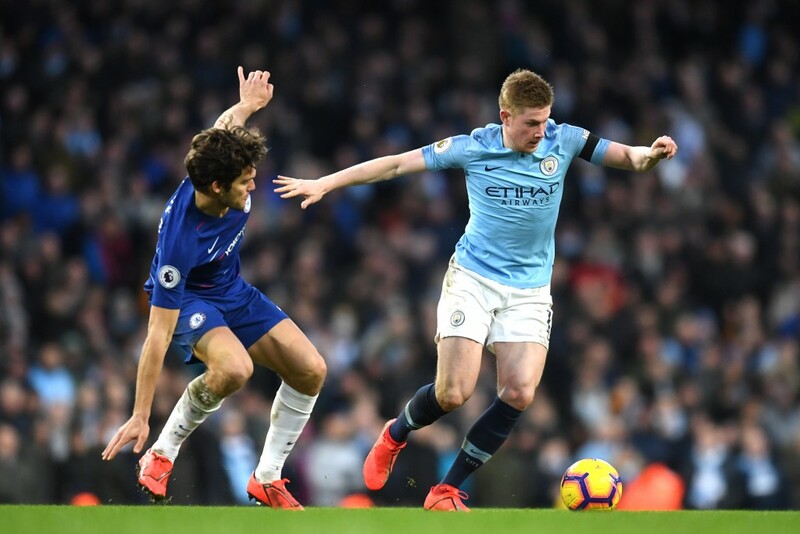 The Italian midfielder endured his worst 90 minutes in Chelsea colours on Sunday evening, as he was completely overrun by the Manchester City midfield. Was guilty of not closing down Aguero in then lead-up to the second goal, while his passing was pedestrian on many occasions. Never got to grips with the game and was in shambles defensively. Preferred over Mateo Kovacic in the middle of the park, after his impressive display against Huddersfield last time out, the Englishman set Aguero’s second goal up with a shockingly hapless header. Offered little in terms of defensive cover on the left-side and was whisked off very early in the second period. Brought back into the starting XI in place of Willian, the Spaniard caused a couple of nervy moments for the City backline in the first half, but could not capitalise, with his finishing letting him down. Offered very little post the half-time break, however, and was subbed off for Ruben Loftus-Cheek. Deprived of any kind of service on the day, the January signing did brilliantly to chest down the ball and fire a volley to force Ederson into making a save in the first period. Prior to that, he had shown good control to set Pedro through on goal. Petered out with time, but did show his quality in those two moments in the first half. Apart from one piercing run after being found by Luiz, the Belgian wing wizard hardly offered anything meaningful in attack. Was very much guilty of lacking awareness leading to City’s opening goal and in general was nowhere to be seen when Chelsea needed all hands on deck defensively. Thrown in for Barkley soon after the half-time break, but did little to impact the proceedings. Replaced Pedro halfway through the second half and offered one or two positive moments, with surging runs forward on the right-side. Came on for Alonso with a little over 15 minutes left. Fired a free-kick straight at Ederson.